Save Christmas! A crisis is brewing in the North Pole! Santa's workshop is running at full capacity. Elves are working overtime, but alas, production is not enough for Christmas Eve! Thousands could be left without presents, and YOU might be one of them! Trains will be passing through every town, headed for North Pole Central. Help Santa stock enough Christmas presents by loading each train to the brim. Do your best, Christmas depends on it! ...... Do your best, Christmas depends on it! Playing the game: To ensure that there will be enough presents for everyone on Christmas Eve, fully load Santa's trains before they leave each town. 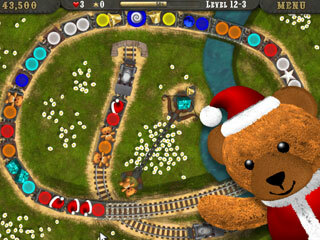 Load train carriages by throwing the correct Christmas presents in their corresponding slots. Launch your trusty claw to retrieve incorrectly placed presents, and also to collect other bonuses from the train. Perform chain reactions and collect stars to increase your chances (and your score)! Qweas is providing links to Loco Christmas Edition 1.20 as a courtesy, and makes no representations regarding Loco Christmas Edition or any other applications or any information related thereto. Any questions, complaints or claims regarding this application Loco Christmas Edition 1.20 must be directed to the appropriate software vendor. You may click the publisher link of Loco Christmas Edition on the top of this page to get more details about the vendor.